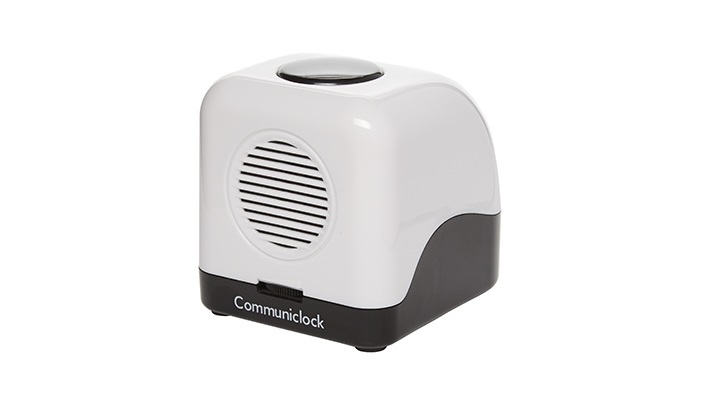 The Communiclock is a speaking clock that announces the time and date at the touch of a button. The simple cube design is easy to use and because it is radio controlled you don’t need to set it. Requires four AA batteries. These are not included. User review: "Not being able to tell the time due to sight loss is really, really frustrating. It's brilliant having the Communiclock: [...] it's portable, it's very easy to find, you don't have to fumble around because the button is so big... It's really easy to set; all you have to do is put it on the windowsill and it picks up the radio signals and then it sets itself. I really, really like the Communiclock." User review by Shazeen. Watch Shazeen talk about the Communiclock in our video. To find out more or to buy the RNIB Communiclock, shop online.